SBIRS’ Sound Surveillance For National Defense, The primary purpose of a government is the protection of citizens. Many have written about, and expounded upon, what the true purpose of a federal government should be—there was a consensus in this regard that was derived in the US some 200 years ago that there are six specific directions that should be addressed: defense, justice, unity, domestic tranquility, citizen betterment and ensuring liberty for all citizens. 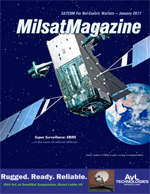 SATCOM providers face significant risk if an equipment problem disrupts the link to a satellite. Now that 2016 has come to a close, I’d like to reflect on the progress we’ve made on the Hosted Payload Alliance’s (HPA) goals, as well as provide some insight on the current state of hosted payloads in today’s satellite industry.